Evelyn doesn't actually use a recipe that is written down, so the list of ingredients will be in the directions below, giving you a choice of what you would like to use in your gumbo. 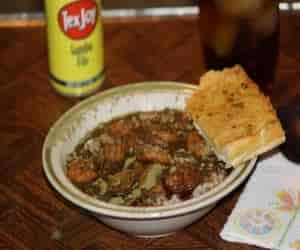 "When making gumbo, we never use a recipe - so, with that being said, I hope this turns out for those who make it. We almost never make a roux anymore, you can make your own, or we let Doguet’s do that for us. It’s just as good as homemade, and it tastes wonderful in any gumbo, or gravy. We like to add some chopped onions, bell pepper, celery and minced garlic; and again, use as much as you like to use. Mom usually will cut up a large onion, large bell pepper, 3-4 garlic cloves and a stalk of celery. She then uses a portion of what will go into the pot to stir into the roux before adding anything else. This gives the roux a good seasoned flavor. After you have stirred your vegetables in and let them cook for a few minutes, usually until they start getting clear, add a cup of water, stir until all the roux has melted away, and you have a mahogany colored gravy. Sautee the rest of the veggies and add them when you start to the water and roux. * When choosing your meat for the gumbo, use your imagination. There is chicken and sausage gumbo, shrimp and crab, or you can combine all the above. Some people put fish in theirs (and lots of times, it has okra in as well). We use green onion sausage. You can add any and all meats together. Clean your meat, season it with salt, pepper, garlic powder - any seasonings you like on your meat. We also use Tony Chachere’s seasoning We use Tony’s on everything though." Once you are satisfied with the seasoning to the meat, add it into the gumbo, cover loosely, and start cooking on a slow fire. Stir occasionally, and don’t let it boil too hard. Evelyn, (Pat Brandon's Daughter says: "I hope this makes sense to you. Neither mom or I ever use a recipe to cook gumbo, and it is a dish that literally takes years to refine. It’s something that comes down to personal preference and taste, but once you refine it, you will always want it! I started learning to make it when I was about 15. I am 52 now and can finally say “mais me, I make a pretty good gumbo, yeah”. It’s c’est si bon! (it’s so good)"
Recipe and photo courtesy of Pat Brandon and Evelyn Brandon.